There is strength in numbers. For our perspective to be clearly heard on issues impacting our Grossmont-Mt, Helix neighborhood, we rely on a robust current membership. Please support our efforts to preserve and enhance the character, quality and lifestyle we enjoy in our wonderful community. Cost for new & renewed membership is $18 per household . Download New Membership/Renewal form (PDF) and fill out the form. Print from the button on the form, or from your browser, or from your PDF reader. 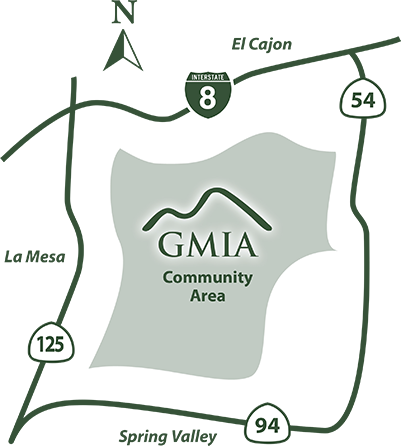 Complete form and make check out to GMIA. Don’t know your renewal date? If you get the Viewpoints newsletter in the mail, you’ll find it on your mailing label. If you don’t, please contact us and we’ll let you know.